I can’t help but wonder if season three will be Sleepy Hollow’s last. If they don’t change their strategy from season two, I think many, like myself, will get bored with the “demon of the week” theme and tune out. I love history, especially legends and folk lore, so I was excited when Sleepy Hollow came to television in 2013. The basic premise was interesting and, of course, centered around the tiny town in upstate New York and the antagonist, the Headless Horseman. That first season laid the foundation for an apocalyptic battle of biblical proportions and introduced the audience to the "witnesses" Lt. Abigail Mills (Nicole Beharie; 42) and Ichabod Crane (Tom Mison; One Day). As the Third season is set to begin October 1st, I took a look back at season two, out now on Blu-ray. Season Two starts basically the same way season one ended. Abbie is stuck in purgatory while Ichabod is buried alive and Katrina Crane (Katia Winter; Dexter) is in the possession of the Headless Horseman/Abraham Van Brunt (Neil Jackson; Quantum of Solace) thanks to Jeremy Crane/ Henry Parrish (John Noble; Fringe) who is the servant of Moloch. If you're not confused yet, you will be by the time you hit the fourth episode of season two. After following the same storyline from season one, season two suddenly veers off in other directions creating mini stand-alone episodes that only touch on the greater plotline. New demons are introduced and defeated each week as Ichabod and Abbie work together to defeat Henry and Moloch. Ultimately, the season ends with many of the demons dead and Sleepy Hollow seemingly safe. For me, the best parts of the show are Beharie and Mison. I think they do a good job portraying the tough, yet sentimental, black, female sheriff and the 200 year old military man caught in a modern day world, respectively. While Beharie and Mison have good chemistry as partners, I don't see the romance the Ichabbie shippers are so yearning to witness. The supporting cast all add to the enjoyment with Abbie's sister, Jenny Mills (Lyndie Greenwood; Nikita) giving support to these two crusaders and Captain Frank Irving (Orlando Jones; Drumline)doing as much as he can from the psych ward (see season one). Winter is intriguing as the witch who suspended her husband Ichabod in time and continues to try and see the good in her son even as he is bent on destroying them all. The 1080p high definition video and DTS-HD Master 5.1 audio are what you would expect from this type of genre. The audio lends itself to the eerie spookiness of the show and the muted color palette enhances the feeling of dreariness and impending doom. The extras were ok with features saluting the "Sleepy Heads" fans, exploring the demons on the show, deleted scenes and the ever present gag reel. With over an hour of extras, fans will have plenty to watch once they review all 18 episodes of season two. 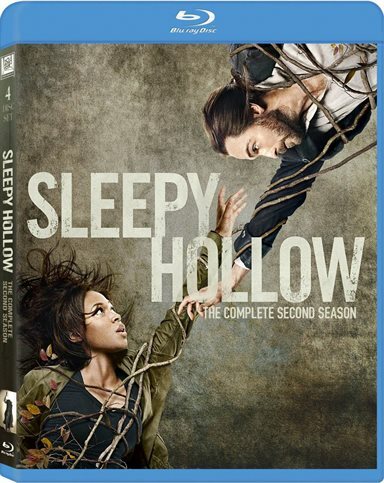 Download Sleepy Hollow: The Complete Second Season from the iTunes Store in Digial HD. For more information about Sleepy Hollow visit the FlickDirect Movie Database.